Who invented Steel? The name of the person credited with inventing the Bessemer Process to create steel from iron is Henry Bessemer (1813 - 1898). Henry Bessemer is not only famous as the English inventor of cheap and efficient steel but also as a designer, engineer, industrialist and businessman. When was Steel invented? Henry Bessemer invented the Bessemer Process to manufacture steel inexpensively in 1855, during the Second US Industrial Revolution / Victorian period of invention (1850 - 1914). Definition of Steel: Steel is defined as a hard, strong grey alloy of iron with small amounts of carbon and usually other elements, used in construction as a structural and fabricating material. Steel is harder than iron and does not rust as easily. Fact 1: Who invented Steel? The ability to produce cheap steel, called the Bessemer Process, was invented by Henry Bessemer in 1855 during the Second US Industrial Revolution era of inventions (1850 - 1914) and the United States moved from the Age of Iron to the Age of Steel making new, exciting inventions possible such as skyscrapers, elevators, tools and instruments. The production of cheap steel helped to make stronger rails for constructing the railroads across the United States of America and Europe. Fact 2: Who invented Steel? Prior to the invention of the Bessemer Process in 1855, the knowledge of steel had been around dating back to antiquity but there was no simple way to create steel from iron which produced steel cheaply, efficiently and in large quantities. Fact 3: Who invented Steel? Steel is an alloy of iron, with carbon. Alloys are metals that combine two or more elements that are often stronger and harder than the pure metal. Fact 4: Who invented Steel? To make steel, iron ore is first mined from the ground. It is then smelted in blast furnaces where the impurities, such as nitrogen, silicon, phosphorus and sulfur are removed. The problem was that there was no simple way to control the carbon level in iron so that the metal could be manufactured inexpensively and in large quantities. Fact 5: Who invented Steel? The ancient process to produce steel involved heating wrought iron in contact with a carbon source, usually charcoal, in such a way as to exclude exposure to air. The quality of the metal was poor and inconsistent. Fact 6: Who invented Steel? Some progress in manufacturing took place in Medieval Europe due to the improved blast techniques due to the use of coal as fuel that enabled increased temperatures to be attained. Fact 7: Who invented Steel? In 1781 the Swedish chemist Torbern Bergman (20 March 1735 – 8 July 1784) had explained the relationship between iron and steel. Understanding the relationship between iron and steel increased further when British chemist, Henry Clifton Sorby (10 May 1826 – 9 March 1908), developed techniques for studying iron and steel with microscopes proving that a small but precise quantity of carbon gave steel its strength. Fact 8: Who invented Steel? These important discoveries paved the way for Henry Bessemer's invention of the Bessemer Process and the mass production of steel. Fact 9: Who invented Steel? Henry Bessemer, was born on January 19, 1813 in Charlton, Hitchin, Hertfordshire, England and died on March 15, 1898. Fact 10: Who invented Steel? The early years of Henry Bessemer were spent in Charlton, Hertfordshire where he was raised by his family. His father was Anthony Bessemer who was an engineer and inventor and was made a member of the French Academy of Science for his amendments on the optical microscope. Fact 11: Who invented Steel? Henry Bessemer received an excellent education before he was forced to end his studies to help his father who was in considerable financial difficulties. 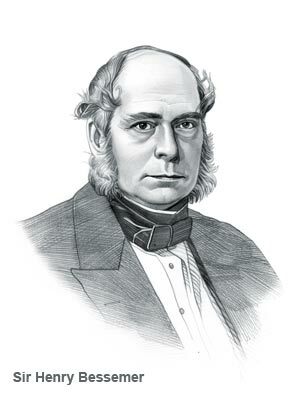 Henry Bessemer developed an understanding of metallurgy, learning about the properties of metals, their production and purification, from his father. Fact 12: Who invented Steel? Henry Bessemer's understanding of metals and his inventive mind led to wealth and success when he invented six steam-powered machines that were used for making bronze powder and gold paint. Fact 12: Who invented Steel? In 1847 William Kelly (1811 - 1888) an American owner of a Kentucky iron-works had started to experiment in processes for converting iron into steel. William Kelly had the idea that fuel would be unnecessary after the iron was melted if powerful blasts of air were forced into the fluid metal. Fact 13: Who invented Steel? William Kelly's ideas were interesting and Henry Bessemer began his quest to find a process to create a cost-effective and efficient method of producing steel. Fact 14: Who invented Steel? Henry Bessemer's theory behind the conversion from iron to steel was that the heat generated by the union of the oxygen of the air with the carbon of the metal, would result in burning off the impurities. The procedure for achieving this would become known as the Bessemer Process, the method of refining fluid iron by passing a stream of air through it. Fact 15: Who invented Steel? Henry Bessemer designed a large, pear-shaped receptacle, with holes at the bottom to enable the injection of compressed air. He called his contraption a converter. The Bessemer converter was filled with molten pig iron and compressed air was blown through the molten metal which was emptied of carbon and silicon in just a few minutes. Fact 16: Who invented Steel? The Bessemer Process made steel by blasting compressed air through molten iron to burn out excess carbon and impurities. Fact 17: Who invented Steel? The Bessemer Process had a few 'teething problems' as it did not remove phosphorus from the pig iron, making the steel excessively brittle. The initial Bessemer process could therefore only be used on pig iron made from scarce and expensive phosphorus-free ores. Fact 18: Who invented Steel? Improvements were made to the process to resolve the problem but industries were sceptical about his invention. Fact 19: Who invented Steel? Henry Bessemer therefore decided to open his own steel making plant which went on to produce steel at prices considerably less than other manufacturers. Fact 20: Who invented Steel? Henry Bessemer was knighted by Queen Victoria on June 26, 1879 for his contribution to science. Later that year Sir Henry Bessemer was made a fellow of the Royal Society. Fact 21: Who invented Steel? Sir Henry Bessemer died on March 15, 1898 and was buried in West Norwood Cemetery in South London. Between 1838 and 1883 he had patented 129 inventions but his name goes down in history as the inventor of the Bessemer Process.